Protesters condemning the shooting death of a black man in his Dallas apartment by a white off-duty police officer have disrupted a city council meeting, prompting a recess to quell the outbursts. Dozens of demonstrators on Wednesday chanted “No justice, no peace,” leading Mayor Mike Rawlings to temporarily halt the proceedings. They say they want the city to establish a civilian board to review police conduct. Protesters condemned the death Thursday of 26-year-old Botham Jean, who was shot after the officer says she mistook Jean’s apartment for her own. Officer Amber Guyger was arrested three days later on a charge of manslaughter and has since been released from jail on bond. About 200 people held a demonstration Monday. Police Chief U. Renee Hall in a statement the next day criticized the police use of “pepper balls” on that crowd. 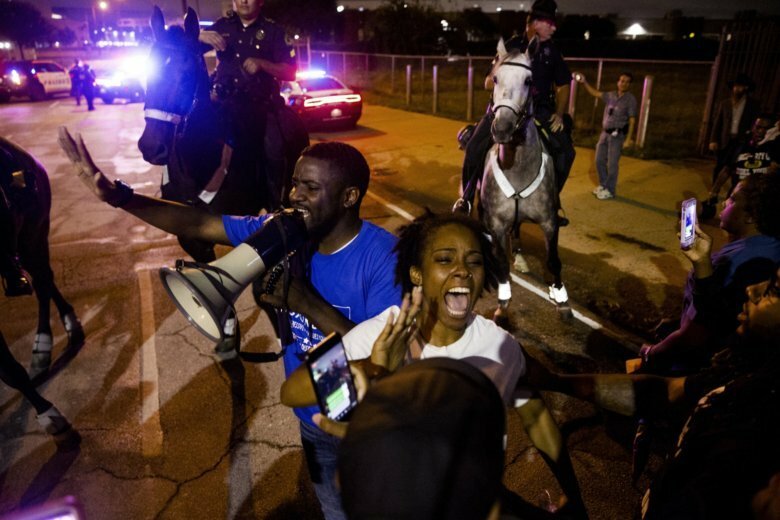 The Dallas police chief says she has called for a full review and plans to meet with protest leaders after learning about reports that police used pepper-spray projectiles at a demonstration over a black man’s death. Chief U. Renee Hall said Tuesday that the projectiles should only be used if there is an immediate threat to the public or if an on-scene commander calls for them to be used. Monday’s demonstration came a day after a white Dallas police officer, Amber Guyger, was arrested for manslaughter in the off-duty shooting death of her neighbor, 26-year-old Botham Jean. Authorities have said that Guyger said she mistook Jean’s apartment for her own when she fatally shot him last week.